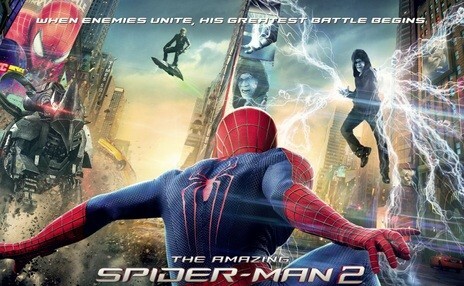 It’s double the villains in this sequel to 2012’s Spiderman reboot. Andrew Garfield is back as the tech-savvy and awkward version of Peter Parker, and he still hasn’t come to terms with his relationship with Emma Stone’s Gwen Stacy. It’s no wonder – he did promise to grant her father’s dying wish and stay away from her to protect her from the collateral damage of his superhero activities. Classic responsibility vs. personal happiness backdrop. Meanwhile, two supervillains arise and this marks the second best thing about this film: the both of them actually come from a good place. One is constantly overlooked and almost bullied despite being highly competent. The other just wants to live. I’m not saying this is never the case in this type of film, but it is still refreshing that they aren’t after power, a political vendetta or a demented desire for mass destruction. The slow pace of the first half of the film serves to set up these characters in a way one can (somewhat) sympathise with them a little and if you can get through it, the rest is almost a non-stop action sequence. A slightly over-the-top one, at that. I did call the villains second best; that’s because the best part of the Amazing Spiderman series is and always has been the one most lacking in the first trilogy: the spark. Garfield and Stone have chemistry in spades and through the uncertainty and life choices they face, you can never lose sight of how much they care for each other. Along with the more fleshed-out relationship, the story is based on significant backstory on Peter’s father and his work at Oscorp. It deepens Peter’s character a little more, as well as giving a more science-based reasoning behind the villains. I know, I know, it’s a superhero movie and all the science is (obviously!) bogus but the disease/mutant angle makes it, in my opinion, more satisfying. Despite this, the film is still dragged down by heavy clichés once in a while, so blatantly added for foreshadowing or tearjerking value that they don’t feel genuine at all. Overall it is a well-made if not surprising genre film with satisfying action and a good story to back it up, and I suspect it will suffer more from comparison with the other super-movies out this season than its own shortcomings; I’m looking at you, Captain America! It’s a good time to be a nerd – let’s enjoy it while it lasts.